Each one of these dog and tick control solutions have their positives and negatives. One or more might be best for your pooch while another may not. For example, a product or solution might work better on a small dog vs. a large dog. Or one control solution may be more effective for a pet that is more heavily infested than another. 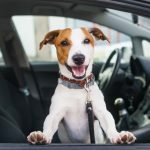 In any case, it’s worth noting that before any dog flea and tick solution is tried, it’s best to contact your pets vet to get their ideas and opinions. After all, most vets are trained to deal with dog flea and tick problems. Additionally, before administering and control solution, it’s best if your dog is as healthy and active as they can possibly be. Let’s look at each possible control solution and sort out which might be best for your dog. One of the more popular dog flea treatments is the flea collar. The first commercial flea collars were introduced in the late 1960’s in the United States. The original flea collar was a simple plastic strip that was made by mixing an insecticide with the plastic. 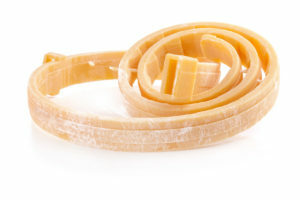 The mixture would then be rolled into a strip and then cut into different lengths. The ends would then be joined with a clip or clasp to join the two around the dogs neck. Dog flea and tick collars are made to deliver or “give-off” enough flea and tick pesticide to ward off or kill flea and ticks. The effectiveness usually lasts from six months to a year. The insecticide used in the collar should be safe for prolonged skin contact with the dog. It should also be non-toxic to the dog should it chew on the collar. There are several chemicals that have been approved for use against flea and ticks in dog collars. One type is based on chemicals known as carbamates. Other chemicals may include tetrachorovinphos, which is also known by the trade name Rabon. More and even safer chemicals are being developed and used in more recent dog flea and tick collars. Though opinions vary, some dog owners say that flea collars are more effective on smaller dogs than large ones. This is because the collar area being further away from the rest of the dog’s body on larger dogs. Additionally, some dog owners say dog collars are not effective in getting rid of fleas and ticks. Especially on a previously infested animal. Whereas dog flea and tick collars might be best suited to keeping fleas and ticks away vs. killing large numbers of them already on the dog. Lastly, dog owners report that, in many cases, flea and tick collars are better at combating ticks than fleas. This is because ticks tend to live in areas around a dog’s head, neck and ears – near the flea collar. Whereas fleas can live all over a dog’s body and extremities. Dog flea combs (along with bathing) are among the oldest form of dog flea treatment and control for our dogs. Since ancient times, we have been using different types of combs, brushes and contraptions through our dog’s fur to get those nasty fleas. And using a flea comb is probably the quickest way to give your dog immediate relief from the aggravation of fleas. 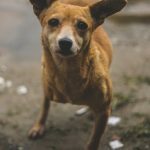 While combing your dog with a flea comb or brush probably won’t do as good a job as some the other products listed on this webpage, you can help give your dog immediate flea relief to feel better. There are many different types of flea combs from which to choose. Some flea combs have just one row of “teeth” to capture the fleas, while others have two or more. One particular flea comb has its metal teeth turned at an odd angle – ninety degrees. 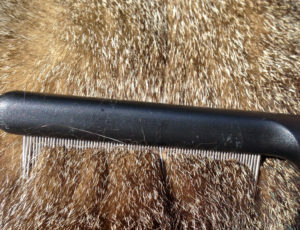 The manufacturer claims that by using this type of comb, that it is more comfortable for your dog and will capture more fleas. Regardless of the flea comb used, this dog flea treatment is one of the easiest, quickest ways to get fleas off your dog. Additionally, many dog owners with chemically sensitive pets use this method as opposed to using products with chemicals in them. Should you decide to go this route in treating fleas on your dog, flea comb your dog daily. Unfortunately, even though you may get the flea, their eggs will continue to hatch days or even weeks into the future. A dog tick & flea shampoo is a medicated shampoo specifically made for dogs that contains certain ingredients that kill fleas, flea eggs and ticks. 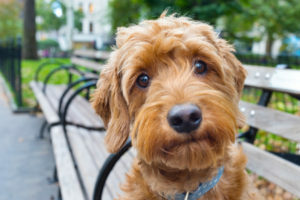 Though several different active ingredients are used in dog flea shampoos, the chemical most used is called, permethrin or pyrethrin (a widely used insecticide). Insecticides are used in a flea shampoo to quickly kill the fleas and ticks off your pet. Remember though that a dog flea shampoo usually doesn’t stop any future fleas jumping on your dog and making a home. As with most products for a dog’s health, there are different brands, purposes and ingredients in a dog flea shampoo. When searching for a flea shampoo, look for one that kills the fleas AND their eggs. Though several flea shampoos have several active and inactive ingredients, the most common one to kill the fleas is an insecticide chemical called Pyrethrins. Pyrethrins are effective against fleas and ticks. However, since it is such a strong and effective pesticide, you might want to consult your vet before applying to smaller dogs or puppies. You might also consider an all-natural or non-chemical shampoo in those cases. Other inactive (non-pesticide) ingredients in a dog flea shampoo can include conditioners, cleaning agents and nice smells. Though these are expected in a shampoo – even for us humans, they are not the main ingredients that get rid of the fleas or ticks. And just like us, your pet may not like the extra lather, smells or ingredients of a dog flea shampoo. So don’t be afraid to try out more than one. Lastly, dog flea and tick shampoos usually are only effective for a week or less. Should you choose to use a shampoo, is to use a good dog flea collar after using a dog shampoo. This way, you will get rid of the existing fleas, ticks and eggs, while keeping new ones away. In addition to shampoos, another method for the treatment and control of dog fleas and ticks is the use of sprays and powders. The main difference between a flea shampoo and a flea spray or powder is the lack of a water bath. In other words, a flea shampoo is usually used with water and then rinsed out. A dog flea spray or powder is usually applied and left on (or in) the dogs coat. And as with flea shampoos, the usual active ingredient is the family of insecticides called Pyrethrins. 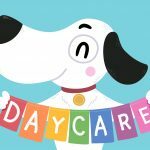 However, since the spray or powder is generally left on the dog after application, the amount of insecticide is usually much less than in a shampoo. There are several advantages of using a dog flea spray or powder. One advantage is that the pet doesn’t need to be bathed. In many case, giving a dog a bath is simply not an option. 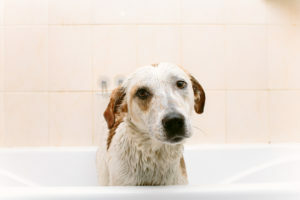 Another advantage of a spray or powder is that the product stays on the dog vs. being applied and then rinsed off in a bath. By allowing the product to stay on, the product has a greater chance of killing the active fleas and then eggs that hatch. Some sprays and powders claim to last several weeks or even months. 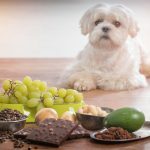 Since these products do stay on your pet for an extended time, they may not be right for all dogs. Smaller dogs, puppies and chemically sensitive dogs, may not be good candidates for a flea spray or powder. Check with your vet if you are uncertain. In reviewing the methods of treatment and control of fleas and ticks, another option are control pills and drops. Many dog owners don’t like the idea of applying a pesticide directly on their dog. Of course, dog flea and tick shampoos, powders and sprays do exactly that. For those dog owners, there are a few oral pills and drops that do treat and control fleas and ticks. 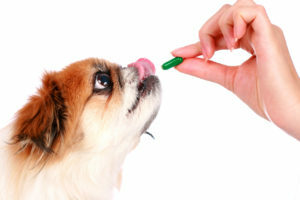 In addition to the control of fleas and ticks, some oral medications also prevent heartworm disease. A few even claim to kill and control other dog pests like roundworms and hookworms. Most dog flea medications given orally to your dog, kill the living flea by way of the dogs blood stream – as fleas and ticks live off of your dog’s blood. However, some oral medications also prevent the fleas from producing eggs. This is beneficial as once the existing fleas are killed, there are no more eggs to hatch to reinfest the animal. 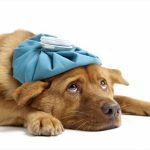 As with any oral pill or drop given to your dog, check with your vet if you are unsure. Read all warning labels for side-effects and watch your dog after giving any oral medication. Side-effects in some cases might be vomiting and diarrhea. Other side-effects also may involve the dog’s coat or general well-being. Be sure and watch your pet after the administration of any flea and tick pill or drop for any potential side-effects. Not all flea and tick treatment and control needs to involve chemicals or insecticides. There are natural and homeopathic ways of treating fleas and ticks. Eliminate the Source of Fleas and Ticks. One of the simplest and most straightforward way of control of fleas is to eliminate the source of fleas and ticks. Most flea infestations begin in a yard or nearby field or forest. If possible, treat the area with either a chemical or natural flea treatment. here are several yard flea and tick control methods that are not chemically based. Secondly, control and or eliminate the fleas in your home. There is little point in controlling the fleas on your dog if they are reintroduced when the dog is in your house. As with outside flea control, there are many natural and homeopathic flea and tick control and leimination products. However, some natural products, such as citrus oils, are not safe for dogs or cats. be sure and check the labels before using a product to make sure it is safe for pets in your home. Eliminate the Fleas From Your Dog. Once you have eliminated the fleas from your home and yard, you need to get the fleas off of your dog dog. The easiest way is with a simple bath. Baths are the oldest way of dog flea treatment. Fleas don’t like water! You can use a natural mild dog shampoo or a simple dish water soap. Keep your dog submerged in the water as long as possible while rubbing the soap into the dog’s fur. The longer the better. A bath, however, will not kill the eggs. Flea eggs are often embedded into the dog’s skin or attached to hair follicles. Water and soap are usually not effective on them. So plan on giving your dog every few days until all of the eggs have hatched and you have killed all of the existing fleas. In addition to a bath, the use of a flea brush or comb is often an effective way of naturally removing fleas from your dog. Not all dog collars that repel fleas need to have man-made chemicals in them. Fresh squeezed citrus juice on a dog’s collar or coat will repel most insects and fleas. But be sure and use freshly squeezed as citrus oils and ingredients with citrus in them may be harmful to your dog. 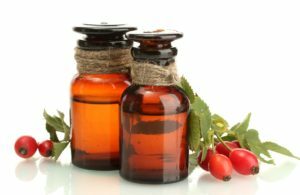 One oil, however, has been shown to be effective to repel fleas and ticks; rose geranium oil. Apply this oil to your dog’s collar on a regular basis – after fleas have been removed by brushing, combing or bathing. As for ticks, however, the best method of prevention and removal is to simply check you dog and remove the tick yourself. There is a correct way to remove a tick from a dog. But if you don’t feel comfortable doing so, consult a vet. Fleas and ticks can become a problem on any dog at any time of year. There are, however, at least six options for dog flea treatment and tick control for your dog.